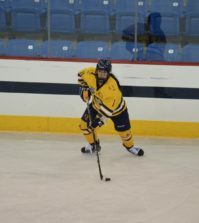 Kelly Babstock scored the lone goal for the Bobcats as they fell to 1-4 on the season. Babstock’s goal came at the 15:30 mark of the second period to break the scoreless tie and give the Bobcats a 1-0 lead in the game. Nicole Kosta assisted on the goal, earning her third assist of the season. 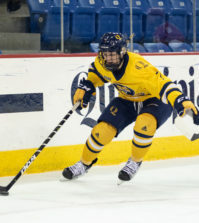 The Bobcats saw their 1-0 lead disappear quickly as the Huskies struck for two goals in the final two minutes of the second period. Kendall Coyne scored to tie the game at 18:32 with assists from Brittany Esposito and Casey Pickett. Rachel Llanes scored 49 seconds later to put the Huskies up, 2-1, with the assist from Lucie Povova. Kelly Wallace added insurance for the Huskies when she was set up by Katie MacSorley and Stephanie Gavronsky to make it 3-1, where the lead would stand up. Freshman goaltender Chelsea Laden made her first career collegiate start for the Bobcats making 32 saves before she was pulled from the game following Northeastern’s third goal. Victoria Vigilanti finished the game in net making six saves in the final 14 minutes of play. The Bobcats return to action this Friday when they travel to Boston College to play the Eagles at 2 p.m.